Better late than never…I don’t reread my old posts, so trying to find one of my best haiku was not an easy feat. But I do remember enjoying writing my haiga last September during 30 Days of Haiga. 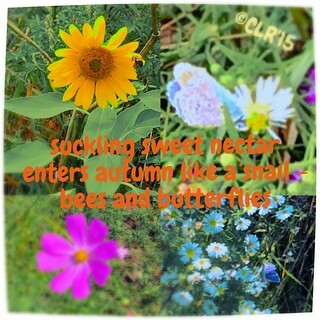 Here is a haiga I chose because it is a moment I treasure, seeing butterlies and blossoms late in the season…in autumn.